Wedding Masters of Ceremonies do more than grab the microphone and talk. 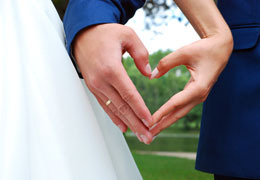 Their presence ensures that your reception proceeds as planned without any missteps. From first dance to a toast to the cake cutting, an experienced MC announces the action with flair and prepares the guests for what is coming. In effect, he or she becomes the coordinator of the event and keeps everything moving smoothly as planned. Check out how our trained Master of Ceremonies can provide you with peace of mind and ensure a flawless wedding reception. ##It’s easy to underestimate the role of a professional wedding MC – until something goes unexpectedly wrong. That’s when the MC steps in and coordinates between the various vendors and wedding planner to keep the flow of the reception moving. This can save the bridal couple a lot of headaches. While DJs and live bands can also perform some of these functions, their attention obviously leans toward entertainment. The best wedding MC know how to exert authority when necessary without alienating others. In fact, a sense of humor is the MC’s most valuable asset. 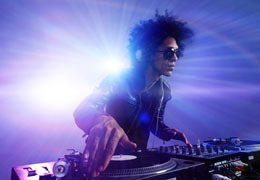 A professional DJ interacts with his or her audience (your guests) to ensure a rockin’ time. He or she both entertains and engages wedding guests with your favorite songs. Our professional DJs are able to keep the room lively with a wide range of music geared to all ages and taste levels. From Sinatra to Swift, an experienced DJ will immerse your reception with great music and keep your guests dancing. With a professional DJ, you have an instant party. ##When hiring your wedding DJ, look at his or her personality. Of course, the DJ will be playing music. But he or she is also an entertainer, hired to keep your guests happy and on their toes. The DJ pretty much sets the tone of your wedding reception, so the right choice is important. ##A good DJ also helps with the flow of events. For example, when you get ready to cut the cake, the DJ will ensure that the photographer is in place to capture the moment. You DJ will interact with your wedding guests to get them onto the dance floor and take special song requests. ##When you hire your wedding DJ, make sure he or she has a wide range of songs to play. Your guests have all kinds of musical tastes; and the DJ should be able to hit most points. Your DJ should also be adaptable to circumstances. The bridal couple may be late, dinner may be delayed, and the DJ should know how to deal with these lapses in time. Let there by music at your wedding! 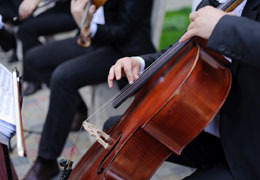 Live music pumps vital energy into your wedding reception. A wedding band provides your favorite tunes in a very visual and unique way. People will either head to the dance floor or tap their toes to the rhythm. A band elevates your reception to an exciting live performance with your guests as the enthusiastic audience. A live wedding band fills the room with electricity. Our selection of live wedding bands knows how to connect to wedding guests and create an incredibly memorable reception for everyone. ##A live wedding band transforms your wedding reception into a unique event. Music is a huge part of any wedding reception, and live music provides a special and unforgettable ambiance. Playing in real time, a live band can remain flexible to individual requests and can perform songs in their own, distinctive way, breathing life and energy into an old favorite. Even people who hate to dance will gleefully stagger onto the dance floor. Those guests that really don’t want to dance can have a wonderful time simply enjoying a live performance. ##A live band doesn’t just perform. They make important announcements and keep the entire event flowing smoothly. Check out our selection of live bands and see how much they can add to your wedding reception. Consider the importance of that first dance or the father/daughter dance when deciding whether or not to hire a first dance instructor. These are not just any dances. These are actually performances, with all eyes on the couple on the dance floor. A professional dance instructor can prepare you for this all-importance part of your wedding reception. Check out our selection of First Dance Instructors and put your best foot forward. ##Let’s face it. On this important day, you want everything to go as planned and make the best impression possible. Stumbling through a waltz or other tune just won’t do it. A dance instructor can turn two left feet into a Fred-Astaire glide in a few lessons. It’s also a sneaky way to fit in a date night while you are engaged. A few dance lessons will help make you feel relaxed and confident on the dance floor. Learn a few different types of dances and be the star of the show. 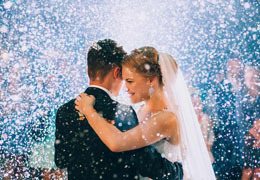 The fact is, many couples consider a perfectly choreographed first dance one of the highlights of their wedding reception. For nervous parents, a first dance instructor will also offer lessons in how to shine during the father/daughter and mother/son dances.